Vorschlag zur bevorzugten Beförderung (Proposal for Accelerated Promotion) for Reino Hamer. This is the front side; the reverse is signed by three other officers, including Kurt Student. Reino Hamer was born on August 29, 1916 in Rastede, near Oldenburg. 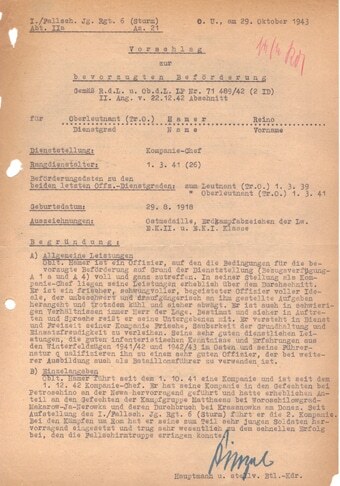 This is a proposal for an accelerated promotion to Hauptmann (Captain.) He received the Ritterkreuz (Knights Cross) in September 1944 for his actions in combat the previous May. American forces captured Major Hamer at Brest, France on September 19, 1944. Reino Hamer died on July 24, 1992 in Ubstadt near Bruchsal, in Baden. 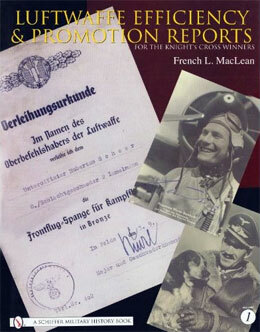 Documents in both volumes are signed by numerous Knights Cross winners and other prominent personalities in the Luftwaffe.